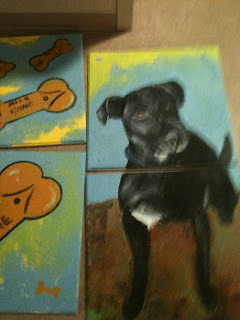 ABOVE : "Patches" a stray dog I once had. 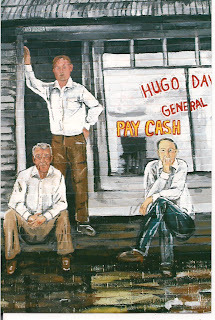 Patches was incorporated into a mural depicting the very first volunteer fire fighting team in Mer Rouge. You can see her at the far right end of the full photograph of the mural. 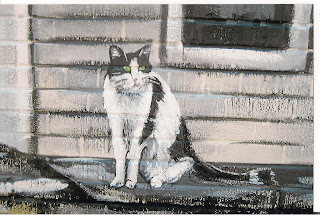 I'm going to let you in on a little secret or two.....my family and close friends are aware of this, but many times when I am commissioned to do a mural, I try to "sneak" in my pets and family members. I would not ever compromise the intergrity of a mural/painting to do this, but every once in awhile, it works out that I am able to do it. It makes me smile to know that my loved ones will live on for a good 30+ years on the side of a building in the Village of Mer Rouge. 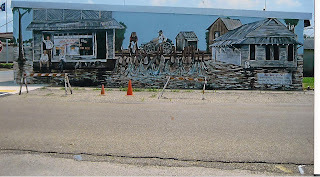 In this mural, I was given old black and white copies of photographs from the 1920's of a tremendous flood that covered the whole area. Some of the faces in the photographs were very hard to make out....so, what else is there for an artist to do but add in her own father, Jerry Sanders, and her favorite uncle, John Spurgeon, into the mural!! I had also become friends with a very nice man in the town whose family helped to establish and create Mer Rouge. His name is Mr. Bill Davenport and he has been a life long resident of Mer Rouge. He joined my dad and uncle in the mural. Next, I was able to surprise my mom, Anne Sanders, and I added in her very favorite cat, Beauregard. He is hanging out on the front porch of the Post Office. Lastly, I added in two black labs who are sleeping on the front porch of the store. They are owned by Cathy Parker of Mer Rouge. She was my contact person for these murals and helped me to get these jobs. BELOW on LEFT: Beauregard the cat. BELOW: Man seated on left-Mr. Bill Davenport. Man standing-Mr. John Spurgeon. Man seated on right-Mr. Jerry Sanders. Many of you know that I am priviledged to own one of the greatest dogs on this earth....LeRoy!! He was a rescue dog who I adopted from a foster family in Rocky Branch and I have had for almost 4 years. 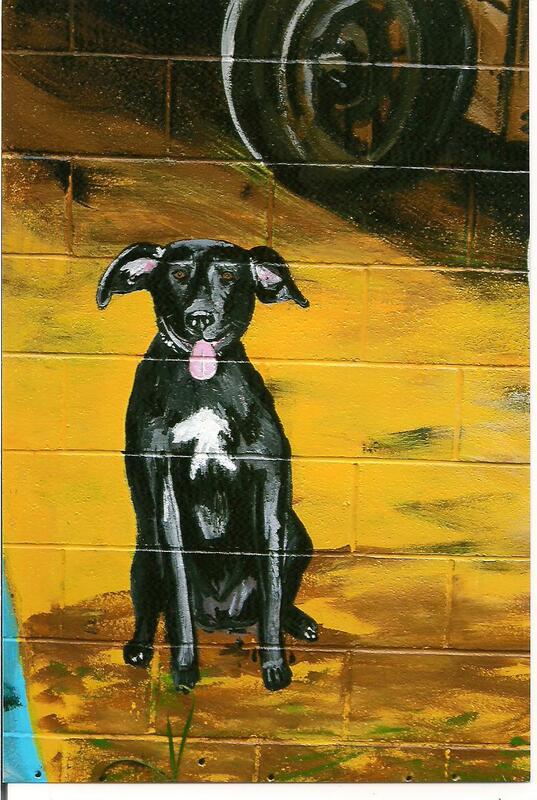 In the first mural I painted for Mer Rouge, I was able to add him in. This mural was enormous!! About 15 feet tall and over 60 feet wide-WOW!! Im still a little amazed when I look back at it. It depicts the subject of cotton which was the crop of choice for many many years. 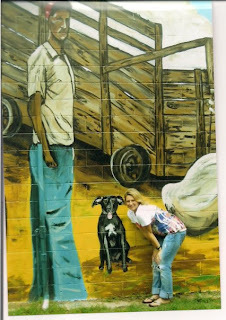 The sponsors of this mural gave me a photograph of the last know cotton pickers by hand, and wanted them incorporated into the mural. I believe hand picking ended in the early 80's and machinery took over. There were other figures that were incorporated into the mural. One was a man behind a horse that is plowing the fields. I made this man into my then boyfriend, and now husband, Brent Compton. (Thank goodness we ended up marrying!! ha). 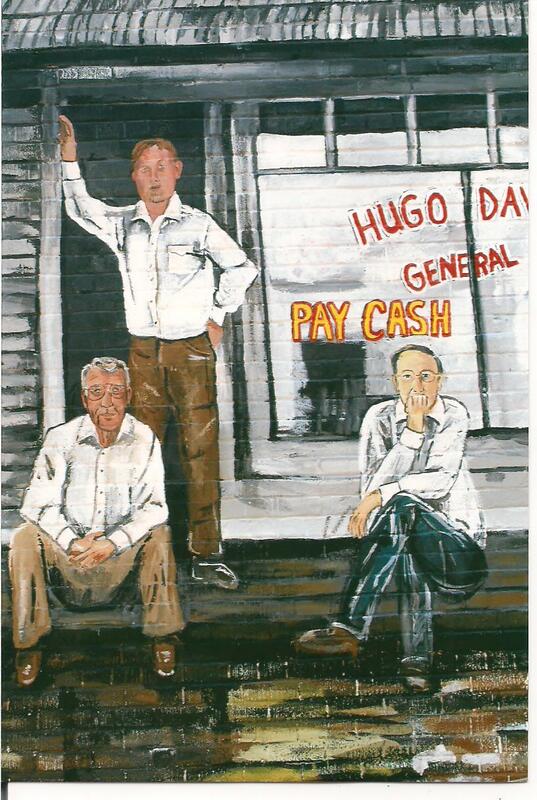 At the far right of the mural, I also added in the local "Dirt Doctor", Mr Pat Bonner. 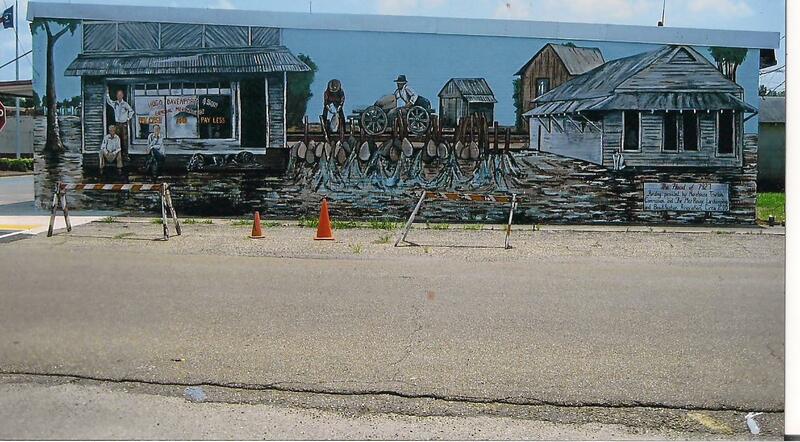 He is a very sweet man who owned the building that this mural is painted on. He always let me use his restrooms and ice machine which I really really appreciated. ABOVE LEFT: Three people around wagon of cotton where last know cotton pickers by hand. Man in blue shirt in front of Murray Ginning System is Mr. Pat Bonner. ABOVE RIGHT: My husband Brent in overalls behind the horse. Okay- yes...I am obsessed...one more of LeRoy!! These were some ceiling tiles that I painted for the Pediatric Wing of Glenwood Hospital. Each children's room got a few painted tiles with different themes installed on the ceiling so the patients could have something joyful and interesting to look at during their stay. This job was commissioned by Shelby's Wish, a local 501C3 non profit. I LOVE knowing my dog and his milk bones are helping a child feel better!! This was a very rewarding profect to work on and I am thankful to Summer Fulton, her family, and their non profit for letting me be apart of it. WOW! 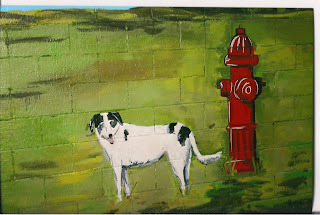 I have always loved murals. 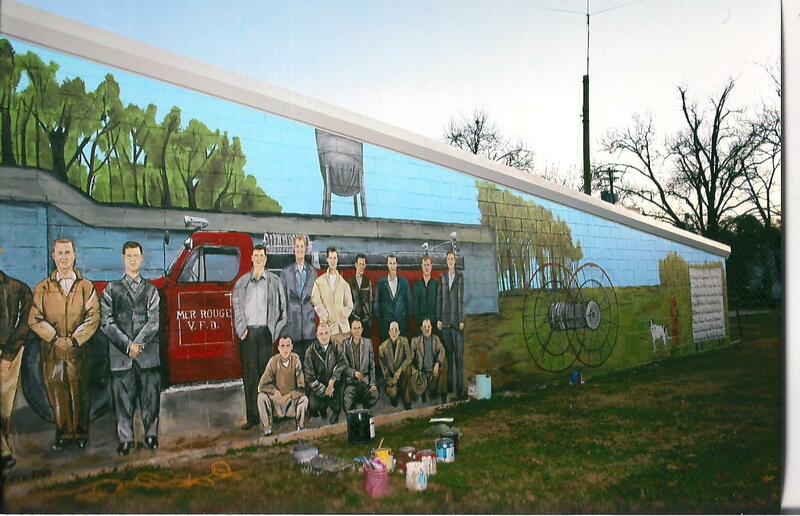 Murals provide a window into history for those who are more visual in their learning curve. Thanks for your great murals and thoughts. Remember that there were great artists & art teachers who also produced murals.